The City of Powell has a three-quarter percent (0.75 percent) municipal income tax that is imposed on anyone who earns income in the City of Powell and on residents who earn income elsewhere. A credit of one-quarter (0.25 percent) is available for income earned elsewhere that has been taxed locally by another municipality, for a net tax due to Powell of one-half percent (0.50 percent). A municipal income tax return is required. ALL RESIDENTS of the City are required to complete yearly Municipal Income Tax Returns – no matter the resident’s age or amount of wages/income. What is the Regional Income Tax Agency? The City’s income tax is collected by the Regional Income Tax Agency (RITA). Tax information and forms are available here or by calling the local Columbus office at 866.721.7482. RITA offers extended hours during tax season. Visit here for more information. Who is subject to estimated quarterly payments and when are they due? Estimated quarterly payments are required for individuals who have not had Powell taxes withheld from their income. Payments are due quarterly on the 15th day of the fourth, sixth, ninth and twelfth month. Estimated payments are due only from taxpayers who have estimated tax liabilities exceeding $200. Does retirement income still get taxed? If you’re retired and are receiving only retirement income as outlined in the City Code, you can complete a one-time exemption form that will exempt you from the yearly Municipal Income Tax return. What if I am moving outside of the City of Powell? If you’re moving outside of the City, make sure to mark your Municipal Income Tax Return as your last return. 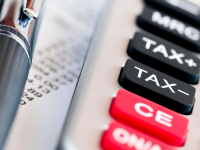 Learn more about municipal income taxes in the City here.